As a "soul having a human experience," you are more powerful than you realize! During the Workshop Days, you will be guided into the altered states, and get in touch with your own psychic and mediumistic abilities with three of the World's Greatest Tutors! Workshop Days are for the beginner and the experienced alike and will enrich your We Don't Die weekend experience. This is a very special opportunity to be part of something greater than you can imagine and be in the arms of those who love you from the other world. Come with an open mind, love in your heart and open to two days you will NEVER forget. Discovering the altered states - providing healing and supports all forms of communication, whether you are a medium or not. Hearing about mediums of the past and what was achieved when groups of friends came together with no expectations. You will learn about creating home circles and sit in your own power as Scott leads you on journeys into the altered states. When you believe in yourself and allow the spirit to step forward, you gain support in all areas of your life. Prayer will be discussed and the different ways of allowing the spirit world to find their voice; a voice that may be heard internally, through you or through a form of phenomena. During this fun-filled workshop, the power of the altered states will support you in all aspects of your personal development, wherever it may lead you. You will be given the tools to return home and practice connecting to this limitless power that will lead you back to eternity. *There will be times during this workshop when you will be sitting in complete darkness. Learning the difference between and unfolding your own psychic and mediumistic abilities. The spirit world can use us in so many different ways when an understanding of the mechanics of mediumship is understood. This workshop is conducted in stages so that all participants gain a full understanding of each topic in a safe learning environment. This workshop will provide through various exercises in a safe learning environment that builds confidence and self-esteem. The essence of the communicator is a vital component within communication with Spirit. This important understanding is to why every communication is unique and different and why there can be no similarities in any demonstration. You will discover Clairsentience, Clairvoyance and Clairaudience abilities. Knowing the full dimensions of these abilities strengthens the communication and brings stronger evidence. Again, this workshop is for the beginner and the experienced alike! 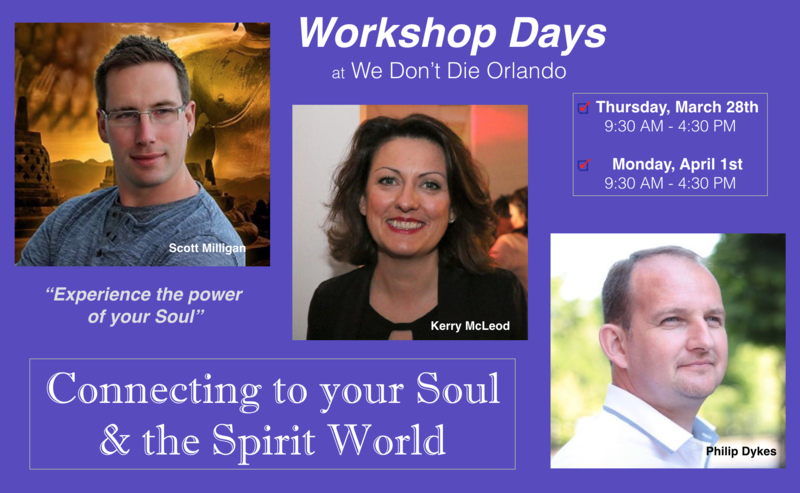 ** If you wish to spend both of two Workshop days with Scott Milligan or both days with Kerry and Phil, we are happy to accommodate. Please write to sandrachamplain@gmail.com with your request. The Workshop Days tend to fill up fast – so please book early to avoid disappointment.